Human nature has always been preoccupied with the future. However, at times we tend not to realise that we mould a substantial part of the future through our actions today. Unfortunately, sometimes our actions today and the future we want, point towards completely different directions. Our future is necessarily a common one, as explained in the 1987 report of the UN Commission on Environment and Development -, the Brundtland report – aptly entitled Our Common Future. Drafted by an international commission led by former Norwegian Socialist Prime Minister Gro Harlem Brundtland, this report placed sustainable development on the global discussion platform, emphasising that we are responsible not only for each other’s welfare today but also for that of future generations. We need to consider carefully that our actions today have a considerable impact and can possibly limit the choices that future generations would have to make. The impact of our behaviour on the climate is one such example. The impact of climate change is causing havoc in weather patterns and consequently also impacting on all areas of human activity. The patterns and intensity of rainfall is unpredictable. Our road infrastructure never coped, and now it is getting worse. Earlier this week The Guardian reported that the planet has just a five per cent chance of reaching the Paris climate goals. Rather than avoiding warming up by more than 2oC by the end of the century, it is more likely that Mother Earth will heat up to around 5oC beyond the pre-industrial era. The predicted consequences are catastrophic. Another report published in April this year had informed us that there are worrying signs for Greenland ice sheet which covers 80 percent of its 1.7 million square kilometres surface area: it has been observed melting faster than ever before. On its own, this factor could potentially cause a rise of many meters in sea level – as many as seven metres. This is certainly not the future we want. Any rise in sea level rise, even if minimal, would threaten the functionability of all coastal areas and facilities. It would also wipe out entire coastal communities and islands worldwide would disappear. It would be a future of climate- change refugees pushed to higher ground by a rising sea-level. This will not only have an impact low-lying islands in the Pacific Ocean: it will also hit closer to home. Take a look at and consider the places along the Maltese coast: Msida, Ta’ Xbiex, Pietá, Sliema, Marsaskala, Marsaxlokk, San Pawl il-Baħar, Burmarrad, Birżebbuġa, Marsalforn, Xlendi and many more. Readers will remember the occasional rise in sea-level at Msida. In one such instant – on 11 May last year – the change in sea level was of more than a metre as a resulting flooding the roads along the coast. This phenomenon is known as seiche (locally referred to as “Il-Milgħuba”) and reported in this newspaper under the heading “Phenomenon: sea-water level rises in Msida, traffic hampered.” It also occurs at St George’s Bay in Birżebbuġa – on a small scale but on a regular basis, causing quite a nuisance to car users. Now this phenomenon only occurs temporarily, yet it still substantially affects traffic movements when it does. Imagine if the rise in sea level rise is of a permanent nature? Large parts of our coast are intensively developed – with roads and residential properties, as well as substantial sections of the tourism infrastructure and facilities. In addition, there is also the infrastructure of our ports which we have developed as a maritime nation over the centuries. 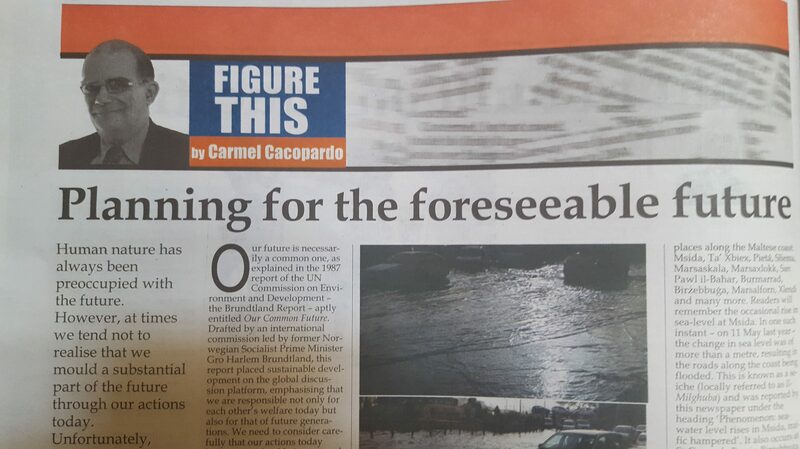 All this points to the need for adequate planning to implement urgent adaptation measures in order to reinforce Malta’s coastal infrastructure. If we wait too long it may be too late. A planning application (PA3592/16) to construct a home for the elderly in the area between Naxxar and Għargħur was due to be discussed by the Planning Authority Board on Thursday. Less than five hours before it was due to begin, however, the public hearing was postponed. There may be valid reasons for the postponement but, so far, such reasons – if they exist – are still unknown. For the past few months, Alternattiva Demokratika, the Green Party in Malta, has been supporting the residents who are opposed to the development of this privately-owned home in their neighbourhood since the planning application was first published. There are various reasons which justify opposition to this proposed development. When faced with such a proposal, the first reactions understandably relate to the direct impact that it will have on the residential community – during both the construction phase and the operational phase of the proposed facility. During the construction phase, this impact would include excavation noise and vibration, the nuisance caused by airborne dust during construction and the general inconvenience resulting from a large construction site very close to a residential community. Once the home is in use, the traffic generated at all times of the day – as well as the occupying of residents’ parking spaces by visitors – will be one of the most pressing concerns to justify opposition to the proposal. These are sensible reasons which justify opposition to the proposed development, even though some mitigation of these impacts is generally possible. 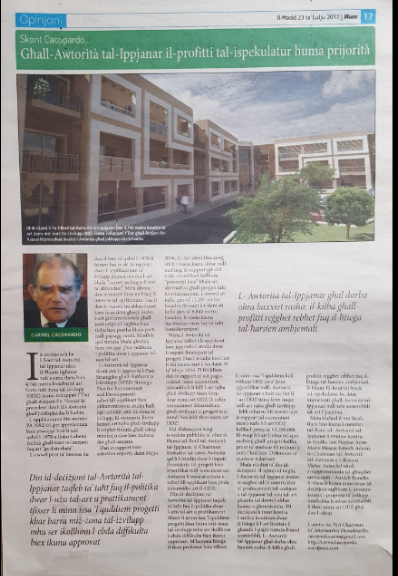 In my opinion, however, before even considering the proposal, it has to be emphasised that the construction of a home for the elderly outside the development zone (ODZ) between Naxxar and Għargħur is a good reason for objection in principle. On the grounds of social policy, to continue encouraging the institutional care of the aged by way of residential homes does not hold water. It makes much more sense to help the older members of our society to remain in their homes as an integral part of the community, close to their roots, as long as this is possible. This should be the preferred option, rather than forcing them to abandon their roots and move away to the outskirts of our towns and villages. The Social Policy Ministry harps on about the integration of the elderly in the community while the authority responsible for land use planning is facilitating their segregation. Obviously, somewhere there is a lack of understanding and coordination. Locating homes for the elderly on the edges of our towns and villages is, in the long term, unsustainable. In addition to fostering segregation, instead of encouraging inclusion, it creates an environmental deficit by encouraging the displacement of a number of the residents of our town and village centres to what is now considered as ODZ land. As a result, this leads to an increase in the number of vacant residential properties while simultaneously adding to the built footprint of the Maltese islands – as if we do not have more than enough developed land! The 2011 Census identified Għargħur as having a 28.5 per cent residential property vacancy rate. The rate for Naxxar was 24.5. These official statistics, which include both vacant properties and partially vacant properties, will undoubtedly get much worse. This leads to another argument against the proposal to provide a home for the elderly in this particular area. 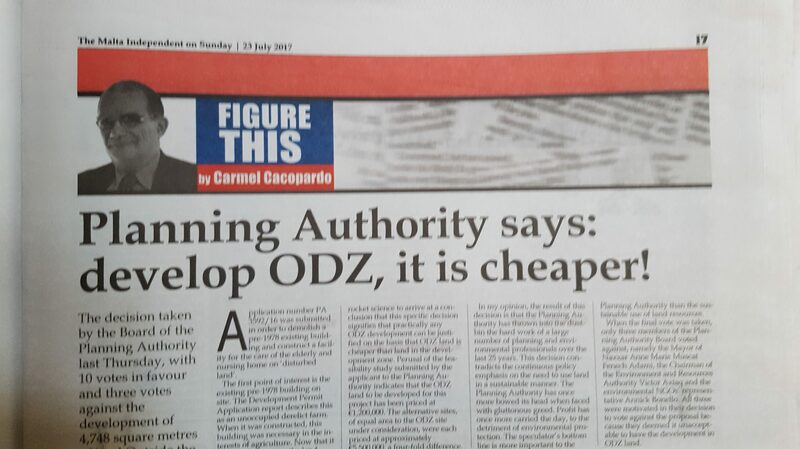 How can we justify taking up ODZ land for further development when even the site selection exercise, carried out as part of the application process, identified alternative sites within the development zone? It seems that not enough lessons have been learnt as a result of the Żonqor debacle. Is it not about time that the Planning Authority puts its house in order? Policy coordination between the Ministries concerned with social policy, sustainable development, the environment and land use planning is obviously the missing link and should be addressed immediately.